"Living Out A State of Mind Pt. 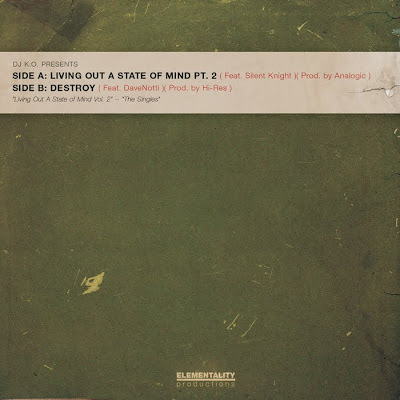 2" is the 2nd single off DJ K.O.’s upcoming EP, Living Out A State of Mind Vol. 2, which again pairs up the two original Elementality members: Silent Knight & Analogic. Picking up where Pt. 1 left off, the track continues to document the story of Elementality. Pt. 2 goes back to the days of 2005 where SK, Analogic & DJ K.O. were beginning to establish themselves in the industry. Keeping with the traditional formatting of the vinyl days, we’ve got a "B-Side" to liberate for this new Digital 12″. While some are becoming familiar with DaveNotti as a producer, "Destroy" introduces the world to him as an emcee. He’s assisted on the boards by fellow Portland, OR resident Hi-Res. The track can be found on their EP, The New Chill. If you happen to sleep on it, don’t worry you can grab a link to download it HERE. Living Out A State of Mind Pt. 2 ft. Silent Knight (Main) by DJ K.O.